An accurate clock is essential for the navigation. For every 15 degree that one travels eastward, the local time moves one hour ahead. Similarly, traveling West, the local time moves back one hour for every 15 degree of longitude. Therefore, if we know the local times at two points on Earth, we can use the difference between them to calculate how far apart those places are in longitude, east or west. In the 17th century, sailors and navigators can find out the local time by observing the Sun, but finding out the longitude require the time of a reference point, e.g. Greenwich. Although accurate pendulum clocks existed in that time, these clocks could not keep accurate time at sea because of the motions of a ship and changes in humidity and temperature. 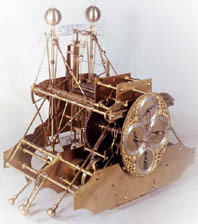 The first marine clock was completed in 1735 by John Harrison. It is spring-driven and only runs for one day. The moving parts are controlled and counterbalanced by springs; therefore, H1 is independent of the direction of gravity.